You may love those traditional tailgating dishes, but by the fourth or fifth game, those classic game day recipes can start to lose their appeal. You don’t have to give your tailgating menu an overhaul — simply give your favorite tailgating recipes a tasty twist. 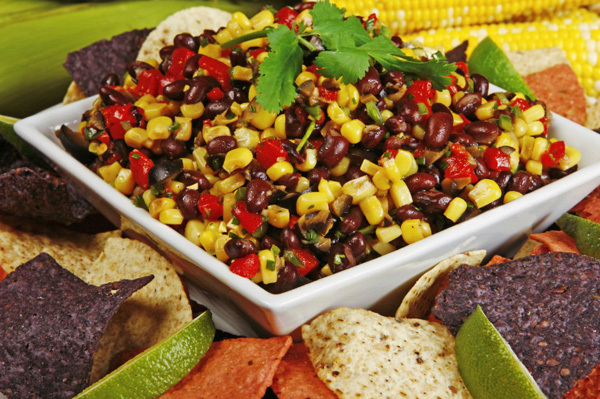 Tomatoes, onions, jalapeños and cilantro are expected salsa combinations, so give your tailgating guests the unexpected by stirring in a can of black beans and corn. Great as a dip for chips, this Mexican-style condiment also is a hit as a topping for hot dogs. In a large bowl, combine all ingredients and refrigerate for a couple of hours before serving. We give chili a healthy twist by using ground turkey in place of beef, lots of vegetables and pumpkin purée as the base. Chipotle gives this tailgating chili a smokier flavor. Heat the oil in a large pot over medium heat. Add the turkey, onion and peppers and cook, stirring often, until the turkey is browned. Stir the garlic and cook for 1 minute. Stir in pumpkin and tomatoes and bring them to a simmer. Stir in cilantro and season with salt and pepper. Serve hot with your favorite toppings. Skewers are fun finger food for adults and kids alike. Lean pork gives this easy tailgating recipe a healthy edge. In a large bowl, whisk together the vinegar, honey, mustard, oregano and oil. Thread pork, peppers and onions onto skewers and brush generously with the honey mixture. Heat the grill to medium and oil the grill grate. Grill skewers, brushing with extra glaze occasionally, for 3 to 4 minutes per side, or until pork is cooked through. Serve hot.